Making sure your customers are happy sounds easy, but there are multiple layers to customer satisfaction. A good customer experience is more important than ever and, because of this, it is important for your organization to shift their views on customer value and how to provide a better customer experience. 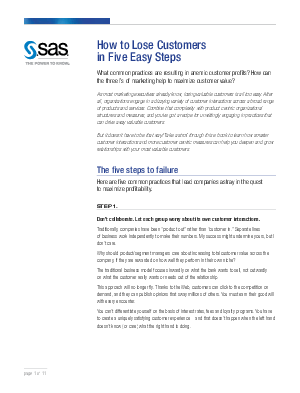 This paper presents the five most common practices that result in losing the customer and how to avoid those pitfalls. You'll also learn how smarter customer interactions and more customer-centric measures can help you deepen and grow relationships with your most valuable customers.